Many apologies for the long hiatus on the blog! It has been really busy the past 2 months on the jewelry crafting front since having to cater to the year end gifting orders and right after it was for the Lunar New Year. I wish I had more time to stop and smell the roses but well, busy is good too! Truth be told, I have never been busier! I wanted so much to share this 2 ingredient no-rise pizza dough recipe I discovered from The Slow Roasted Italian. Like many others who blogged about this recipe, I too felt very skeptical about how this dough will turn out. I went ahead to try it anyway... half of me expecting it to fail and preparing to call for pizza delivery. But surprise surprise! It turned out wonderfully crisp on the edges and not at all soggy. It almost felt like we were having gourmet pizza! 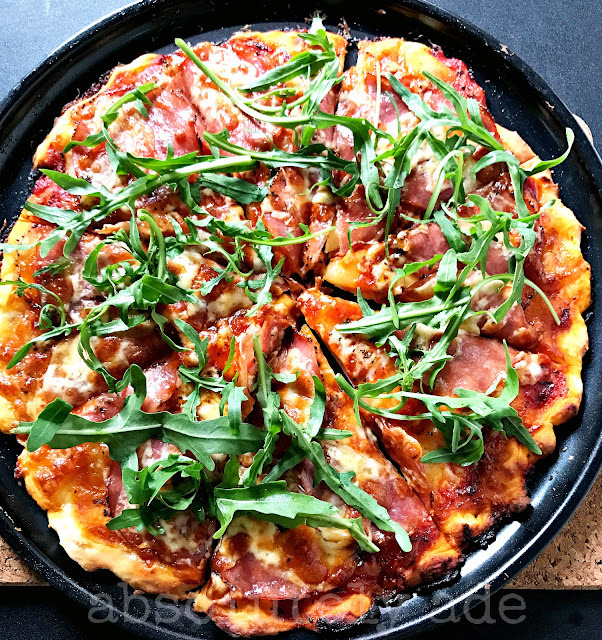 Definitely a must-try if you ever thought that it is too difficult a task to prepare a pizza dough. - Set oven to 200 degrees celcius. Pardon the photo quality as I don't have fantastic kitchen lighting. - Instead of kneading the dough on the counter top,which can be a messy affair, I kneaded the dough directly from the bowl for a few rounds, sprinkling more flour on it as necessary, until the dough doesn't stick to your hands when you pull away. - I used a 12" pizza pan with holes at the bottom and another 9" round baking pan. Spray a light coat of olive oil on the base of the tray before placing the rolled out dough on it. - You can either roll the dough out on a flat surface with a rolling pin or as I did, I took slightly more than half the portion of the dough and placed directly on the pans, then used my hands to spread the dough to the edge. In fact you can also shape it as desired! 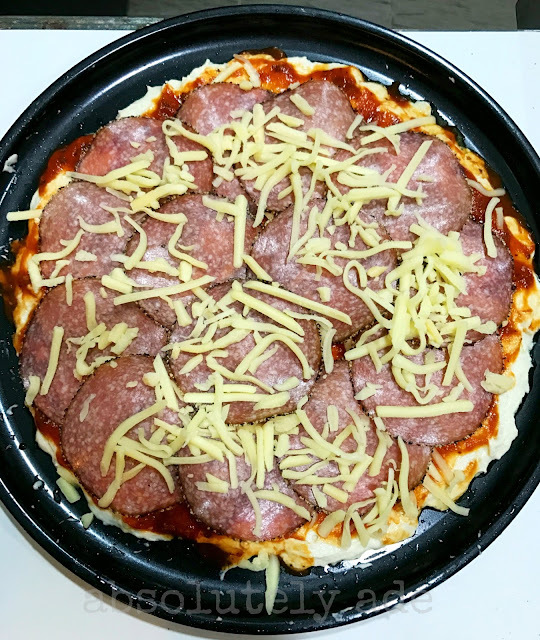 This is the uncooked pizza, with cheeses, tomato based sauce and pepperoni. You can add any of your favorite toppings! - Bake the pizza for 12-15 minutes, until the edges look crisp and the toppings are browned. 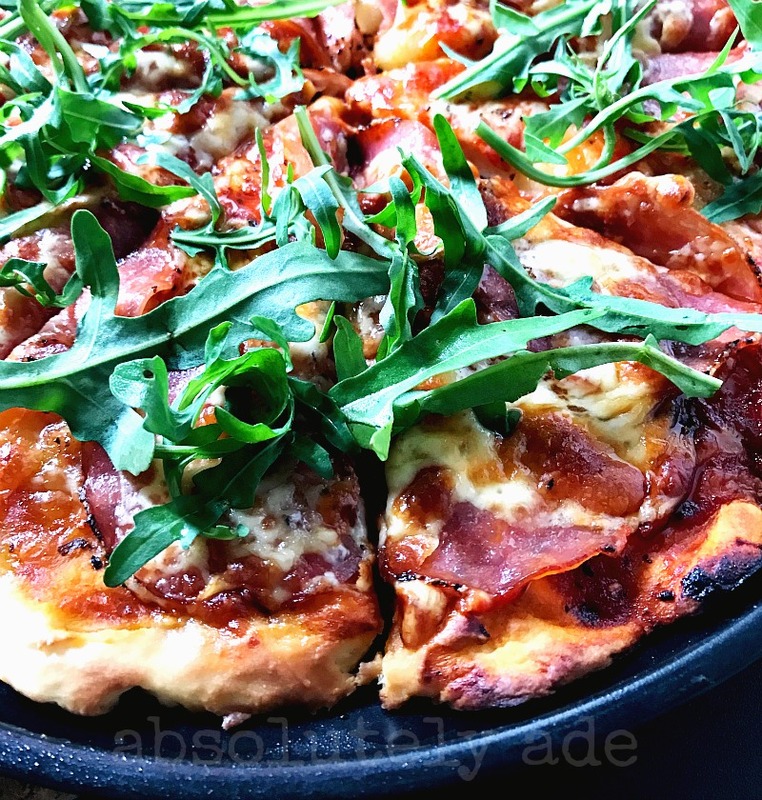 - Slice them up into portions, add wild rockets on top (mmm our favorite!) and serve! Till the next post, have a wonderful day!